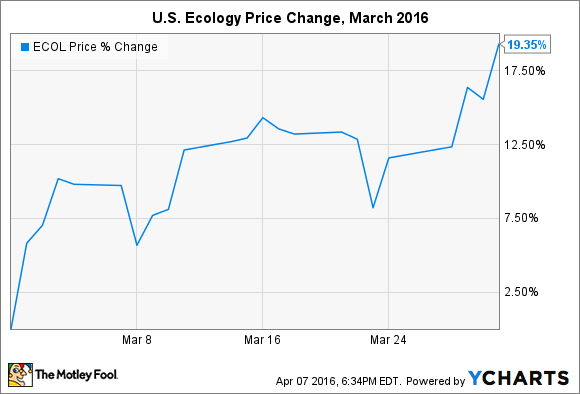 Shares of U.S. Ecology had a great run last month. Here's what you need to know. What: Shares of environmental services company U.S. Ecology (NASDAQ:ECOL) rocketed 19.3% higher in March after the post-earnings rally from February carried over for another month. That may have been expected after shares briefly tanked to levels last seen in mid-2013 with no news to warrant the move outside of the general trend of industrial customers slowing down due to global growth headwinds. So what: In mid-February, U.S. Ecology announced full-year 2015 earnings and provided healthy guidance for 2016, which forced shares into an about-face and resulted in big gains. Last year was the first full year with the acquisition of EQ Holdings contributing to the top and bottom lines, which saw total revenue and gross profit grow 26% and 18%, respectively. That was accompanied by a 27% uptick in selling, general, and administrative expenses, which resulted in a slight decrease in net income. However, investors shrugged that off after management guided for adjusted EBITDA in the range of $126 million to $132 million in 2016 -- an increase of between 3% and 8% over 2015. That, coupled with encouraging economic signs in the American economy, seemed to have tipped the scales for shares to recover well into March. Now what: While commodity and manufacturing headwinds remain outside of U.S. Ecology's control, the company maintains an important and leading role in a "boring" industry. The major acquisition in 2014 shows that management isn't scared to whip out the elephant gun, and most importantly, keep an eye on the long view. Knowing that, investors should keep an eye on the company's efforts to reduce expenses and continue growing organically, both of which should have a big impact on earnings and valuations in the coming year.